Calling the denim jacket a ‘style essential’ is like saying the sky is blue or that we’re just a little bit jealous of Ryan Gosling. The piece that has been around since the late 19th century has been given a new lease of life lately, resulting in pieces like this washed-out khaki example by AllSaints. Available at House of Fraser, priced £118. Uniqlo is famed for the softness of its Supima cotton T-shirts. But biceps aren’t the only body part beginning with ‘B’ the fabric can be put to work on. Take a look at these printed boxer trunks – we’re sure you can work it out. Available at Uniqlo, priced £5.90. The easiest way to make warm-weather dressing a cakewalk is to invest in a neatly cut pair of cotton chinos. Ted Baker’s tapered fit Tapcor model is guaranteed to become a power player in your casual roster this summer, boasting a unique geo print lining to the ankle. Available at Ted Baker, priced £99. Best known for its tough as nails work boots, this season Timberland is lightening up with the launch Adventure 2.0 Cupsole sneakers. The sleek design still packs a whole toolbox of tricks including a breathable mesh lining and reflective laces. Available at Timberland, priced £120. Designed in London, with inspiration taken from different regions across Africa, Okun is quickly making a name for itself in the beachwear game. This T-shirt, in a very appropriate sand colour is ideal for topping the label’s line-up of vibrant tailored swim shorts. Available at MatchesFashion, priced £50. Good for more than just keeping your body hair in check, Braun also turns out handsome design classics for the everyday. The sleek profile of this stainless steel mesh watch is a masterclass in understated accessories, blacked out with just a colour-pop second hand in orange. Creating the most comfortable Vans ever is a tall order when you consider models like the Old Skool have been appreciated by non-skaters for its spongey goodness for decades. But that’s what the Californian brand has achieved with the UltraRange, a new breed of skate shoe that pairs a cosy knit upper with a foam midsole and inverted waffle sole design. Available 1 August at Vans, priced £75. Now, we’re not endorsing Love Island-levels of shameful buff-bragging here, but a muscle fit top is a way of showing off hard-won guns. Topman’s salt and pepper flecked polo shirt shows off the retailer’s range of fits, offering 3XS-3XL and everything in between. H&M’s raw-edge check cotton shirt should come with a warning that it might (definitely) attract jokes from ‘hilarious’ older relatives about needing new clothes. Providing you can handle that, the frayed finish is a solid way to rough up your white jeans. Available at H&M, priced £19.99. Denim has been everything from battered and bruised to wide and flowing in recent seasons, but there’ll always be a place for bluer than blue jeans in our books. 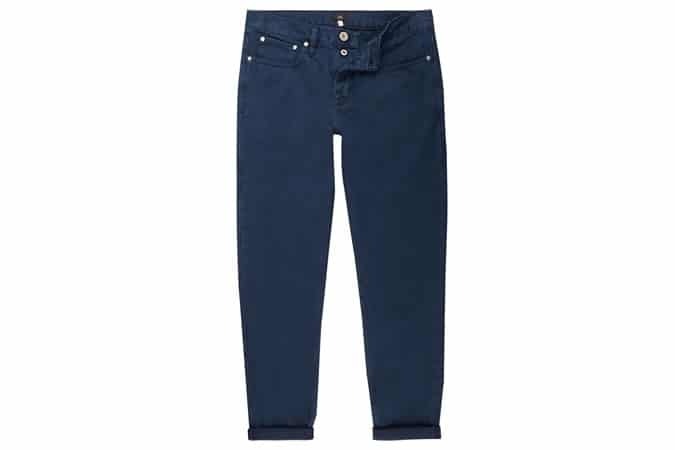 This pair from River Island serves all the charm of vintage workwear but with a modern tapered cut. Available at River Island, priced £45. A black crew-neck T-shirt is the antithesis of Gay Pride marches currently taking place across the UK. That is, unless you let designer Philip Normal cover it in rainbow-coloured lettering as Boohoo Man has done with its first LGBT-focused collection. If that isn’t enough to make you attempt a finger snap, 10 per cent of proceeds will also be donated to charity. Available 31 July at Boohoo Man, priced £10. If you’re lucky enough to work in an office where showing pins won’t land you a P45, swapping trousers for shorts is a stylish way to beat the heat. Top this neatly cut pair from Hugo Boss with a white T-shirt or shirt, an unstructured navy blazer and bookend with loafers for a promotion-worthy look. Available at Amazon, priced £72.58. Having to haul all your beach essentials in your swim shorts is about as fun as being downwind from an outhouse. Fortunately, the beach bosses at Frescobol Carioca have produced this handy pouch. Crafted from Italian linen canvas, it safely stows all your valuables in one place and saves you carrying a bum bag (shudder). Available at Frescobol Carioca, priced £65.